Chronic migraine is a debilitating disorder that affects roughly one in fifty people globally with the cost to the National Health Service in the UK estimated to be £150 million each year. A neurotransmitter called CGRP is known to play an important role in migraine disorders and small molecule drugs that inhibit CGRP function have proved effective treatments. Problems with formulation and toxicity, however, have prevented these molecules from achieving regulatory approval. There is a now a race to market between several CGRP targeting monoclonal antibodies that offer migraineurs the prospect of effective treatments with fewer side effects. 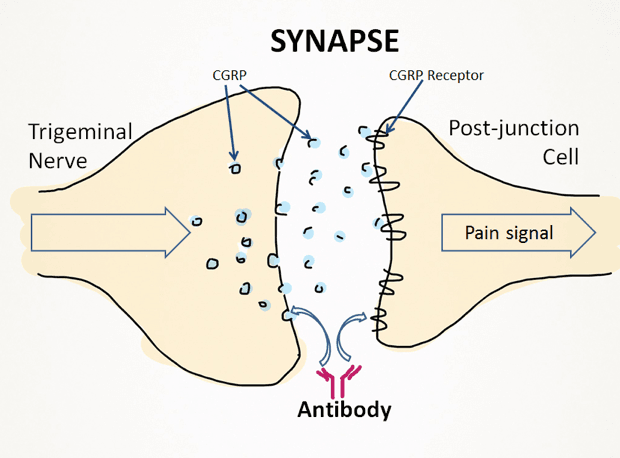 Here we review the discovery of CGRP, its involvement in migraine and the current status of clinical trials of the new antibody treatments. Calcitonin Gene-Related Peptide (CGRP) was discovered in the 1980’s when it was shown that alternative processing (splicing) of the mRNA encoding calcitonin protein leads to CGRP production in the thyroid. CGRP is now known to be widely expressed in neuronal tissue in two major isoforms designated alpha and beta, which have similar structures and biological activities but are formed by separate genes. The biology of CGRP is complex and it has several important roles in the body. For example, it acts as a potent vasodilator affecting the force and rate of heartbeat, it can modulate acetylcholine receptor function at the neuromuscular junction and has been demonstrated to block tolerance to morphine. CGRP can also modulate antigen presentation by Langerhans cells in the skin, an important immune function. Nerve cells join at a synapse where Calcitonin Gene-related Peptide (CGRP) is thought to play a role in the transmission of pain signals. Monoclonal antibodies can modulate CGRP signalling either by binding and neutralising the CGRP itself or by blocking its receptor. Clinical trials are currently ongoing to test this as an effective therapy for migraine prevention. With the different effects of CGRP in the body, it was not clear which mechanism was most relevant to migraine. However in the 1990’s a role for CGRP’s pain transmission properties was established in seminal experiments that showed rising levels of CGRP in jugular blood, but not abnormal patterns of blood flow signalled a migraine attack in patients. On relief from migraine pain, levels of CGRP in the body return to normal. In later experiments, researchers injected CGRP into the blood of migraineurs and found that they developed migraine-like headaches within hours, whereas non-migraineurs suffered at most a mild headache. With clear evidence of a role for CGRP in migraine the next step in developing a therapy was to pharmacologically modulate CGRP function and monitor symptoms in patients. The first attempts to inhibit the CGRP pathway used the small molecule drugs olcegepant administered intravenously, and telcagepant, an oral preparation. Both were found to be effective migraine treatments in randomized, placebo-controlled trials. However, monitoring safety is an important aspect of clinical trials and problems with formulation in the former and liver toxicity in the latter prevented these molecules from reaching the market. Antibody therapy carries several key advantages over traditional small molecule medicines that are relevant to migraine. Precise target specificity, long half-life in the body (generally weeks to months), low risk of drug interactions, and limited potential for off-site toxicity make antibodies attractive therapeutic agents. Further, due to their vulnerability to digestive enzymes, antibodies are administered parenterally. Avoiding oral administration is of particular importance for migraineurs, who often experience gastroparesis during or between migraine attacks. Lastly, dosing of antibodies monthly or even quarterly is likely to increase patient compliance compared to daily oral preventive medicines. Erenumab Amgen Receptor EM, CM Phase III trials completed. EM: episodic migraine, HFEM: high frequency episodic migraine, CM: chronic migraine, EC: episodic cluster, CC: chronic cluster. Given that antibody therapy should avoid the problems encountered for small molecule drugs, four pharmaceutical companies are currently racing to complete clinical trials of therapeutic antibodies. These antibodies modulate CGRP signalling either by binding and neutralising CGRP itself or binding its receptor and blocking intracellular signal transduction, as represented in the figure above. The mechanism of action, particular migraine indication and current status of clinical trials of these medicines are summarised in the table. So far the results are promising and suggest the drugs work faster, for longer and are more effective than currently available treatments. More data from the on-going clinical trials are expected later in the year. No preventive drugs specific to migraine have become available in the last twenty years and existing acute therapies require improvement. The monoclonal antibodies currently in clinical trials are a new generation of drugs that have been rationally designed for migraine prevention. While CGRP targeting antibodies have numerous advantages over currently available treatments, post-marketing surveillance will be essential to monitor any side effects and determine safety in both long-term use and special populations. Nevertheless, the coming year will be an exciting time for both migraineurs and clinicians with results from many trials being reported, and potentially new treatments becoming available.